CHOICE Kitchen & Cocktails specializes in hosting parties, events and special occasions. We offer multiple settings for you to host the perfect event. Our private "Choice Room" with full bar & cozy fireplace is perfect for Private Parties and Corporate gatherings. 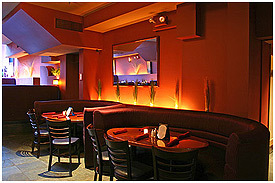 The Brick Room elegantly decorated, is the ideal setting for larger parties. Our Island Bar is the best choice if you're looking for a casual space to gather with friends for cocktails or to watch your favorite teams. Your destination for Birthday Parties, Special Occasion Dinners, Re-Unions, Rehersal Dinners, Bridal & Baby Showers, Corporate Holiday Events, Intimate Wedding Parties, Fund Rasiers, Corporate Meetings/Presentations and Outside Catering! The perfect venue for large group dining. Ask about our BIRTHDAY PARTY at The Rockwall (up to 30 guests for a full cocktail/dinner/sit down party) in a semi-private area in the Brick Room. Repeat Clientel & Guests include:Credit Suisse, Morgan Stanley, Grey Advetising, Mt. Sinai, Golf Channel, Pfizer, Reuters, Thomson Financial, Ernest & Young, NYU Medical, Barauch College, Yahoo, Macy’s Group, Lennox Hill Hospital, Citi Group, TD Bank, The Whitney , JP Morgan Chase, Vista Group, NBC, Mutual of America, and many others. Entire venue rental available for large events. Our experienced, friendly event coordinators will work with you to ensure your event is a success! For further information contact Katie Medico, CHOICE Party Coordinator, at 212.779.1380 or at 646.320.6703. Please fill out this short questionnaire and our party coordinator will contact you to plan your special occasion.